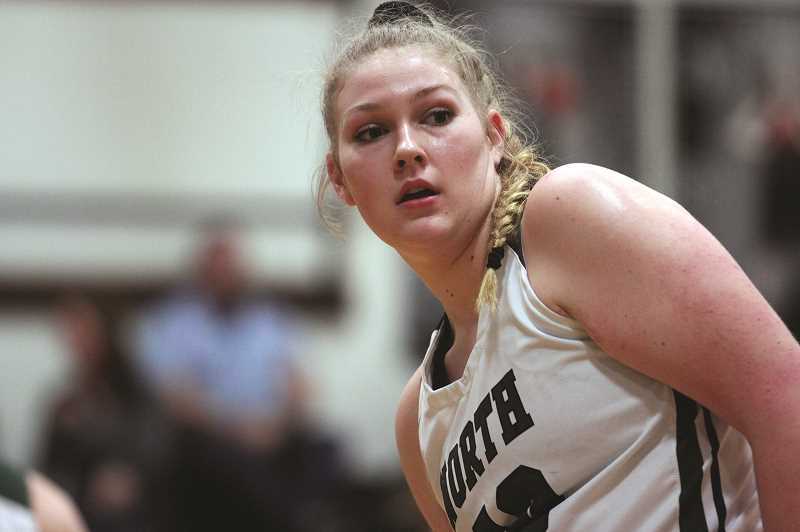 The North Marion girls basketball team continues to rank among the best 4A teams in the state after winning a pair of games last week to remain unbeaten in the Tri-Valley Conference. The No. 3 Huskies (13-5, 4-0) beat the visiting Estacada Rangers (3-15, 1-3) 50-24 on Jan. 22 and followed with a 49-28 win over the Gladstone Gladiators (8-10, 2-2) on Friday. North Marion was scheduled to host the Corbett Cardinals (3-14, 0-4) on Tuesday in the final game of its first sweep through the league schedule. The Huskies will finish the week at home against Molalla (10-8, 2-2) on Friday. The Woodburn boys basketball team picked up a pair of road victories last week to stay within a game of the league-leading Stayton Eagles. The No. 4 Bulldogs (15-3, 5-1 Oregon West Conference) opened the week with a 66-52 win over the Cascade Cougars (9-8, 1-5) on Jan. 22 and followed with a 52-47 victory over the Philomath Warriors (10-7, 2-4) on Friday. In Friday's game, the hosting Warriors jumped out to a 20-11 lead midway through the second quarter before Woodburn's defense took hold of the game. The Bulldogs held Philomath scoreless for six minutes during a 16-0 run, taking the lead for good en route to the victory. Woodburn senior Ryan Stebner led the Bulldogs with 16 points, followed by 15 from senior teammate R.J. Veliz. The two teams kept within striking distance for the remainder of the game. Woodburn would go up by a couple baskets, only for Philomath to answer back. Holding onto a 45-43 lead with five minutes left in the game, the Bulldogs went on a 5-0 run, holding Philomath scoreless for a four minute stretch to put the game away for good. Woodburn return to the court this week for the second half of their league schedule. The Bulldogs were scheduled to travel to No. 9 Sweet Home (13-5, 2-4) on Tuesday before finishing the week at Sisters (10-8, 3-3) on Friday. The Woodburn girls basketball team continues to search for its second league victory after losing a pair of games last week on the road. The Bulldogs (3-14, 1-5 Oregon West) fell 42-32 to the Cascade Cougars (7-9, 2-4) on Jan. 22 before dropping a 58-21 game at No. 6 Philomath (16-2, 6-0) on Friday. Senior Tatian Garcia led the Bulldogs with seven points against the Warriors, followed by four each from senior Jordan Mann and freshman Aria Kent. Woodburn was scheduled to travel to Sweet Home (1-16, 0-6) on Tuesday in the only game of the week for the Bulldogs. The two teams met earlier this season, with Woodburn emerging with a 47-42 win for its lone league victory thus far.